Definition at line 36 of file Interval.h. Definition at line 45 of file Interval.h. Definition at line 44 of file Interval.h. Definition at line 43 of file Interval.h. Definition at line 47 of file Interval.h. Definition at line 66 of file Interval.h. Referenced by isLoop(), and llvm::IntervalIterator< NodeTy, OrigContainer_t, GT, IGT >::operator++(). Definition at line 51 of file Interval.h. Definition at line 26 of file Interval.cpp. References contains(), E, I, llvm::pred_begin(), and llvm::pred_end(). Definition at line 76 of file Interval.h. Referenced by llvm::IntervalIterator< NodeTy, OrigContainer_t, GT, IGT >::operator++(). It is only valid to compare two intervals from the same partition, because of this, all we have to check is the header node for equality. Definition at line 88 of file Interval.h. References isLoop(), llvm::RISCVFenceField::O, and print(). Definition at line 36 of file Interval.cpp. 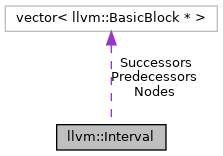 Nodes - The basic blocks in this interval. Definition at line 54 of file Interval.h. Referenced by llvm::addNodeToInterval(), Interval(), and llvm::IntervalPartition::print(). Predecessors - List of BasicBlocks that have this Interval's header block as one of their successors. Definition at line 63 of file Interval.h. Referenced by llvm::pred_begin(), and llvm::pred_end(). Successors - List of BasicBlocks that are reachable directly from nodes in this interval, but are not in the interval themselves. These nodes necessarily must be header nodes for other intervals. Definition at line 59 of file Interval.h. Referenced by llvm::IntervalIterator< NodeTy, OrigContainer_t, GT, IGT >::operator++(), llvm::succ_begin(), and llvm::succ_end().